You know what’s the absolute worst? The sinking feeling you get when you finish checking out at Target, look down at your jam-packed cart, and suddenly remember that you are parked on the exact opposite end of the mall and cannot take your cart with you. 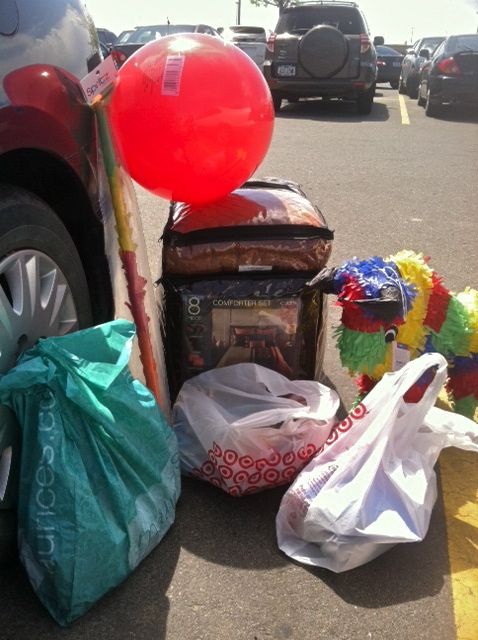 Especially when your purchases include a comforter set, a colorful bull piñata, a piñata bat, and a large red bouncy ball just because. I don’t know what was funnier to today’s mall-goers—the sight of me walking across the mall carrying all these items, or the site of me photographing them next to my car as proof that I’d made it. You couldn’t talk them into letting you borrow the cart, pretty please, promise I’ll bring it right back? That was a lot of stuff to haul. What did you do with your extra four arms when you got to the car? Cool – I didn’t know you could buy a pinata bat! I had a weird shopping experience today, too. I accidentally shoplifted 4 items at Walmart. I’ll go back and pay BECAUSE IT IS THE RIGHT THING TO DO! Ha-ha. I feel your pain!! Too funny. I’ve tried for about a minute to figure how you were able to carry all of that yourself. Impressive! I don’t entirely remember, to be honest. I do know that the ball was tucked into my armpit.